Paper - Mason-D'Croz, D., et.al. (2016) Multi-factor, multi-state, multi-model scenarios: exploring food and climate futures for Southeast Asia. Environmental Modelling Software 83:255-270. Paper - van Soesbergen, A., et al. (2016) Exploring future agricultural development and biodiversity in Uganda, Rwanda and Burundi: a spatially explicit scenario-based assessment. Regional Environmental Change, pp.1-12. Land-use decisions have major impacts on biodiversity and ecosystems, and the goods and services they provide to people. The human population is expected to reach 9 billion by around 2050. In the coming decades, society will have to balance competing needs for land for food, resources and energy to satisfy the ever-accelerating human demands, with efforts to mitigate climate change and reduce biodiversity loss. Decision-makers need to balance competing demands on land and resources whilst also accounting for potential changes in these demands in the future. Yet, it is impossible to predict economic, political and social conditions in the medium- to long-term future, and many of the drivers of change that determine these conditions are beyond the control of decision-makers. In addition, changing demands upon land under future conditions may lead to impacts on biodiversity and ecosystem services that vary over time as well as over space. With funding from the John D. and Catherine T. MacArthur, and in partnership with the CGIAR Research Program on Climate Change, Agriculture and Food Security (CCAFS) and the Albertine Rift Conservation Society (ARCOS), UNEP-WCMC developed an analytical framework combining scenarios, modelling and mapping to help support land use related policy development under future uncertainty. 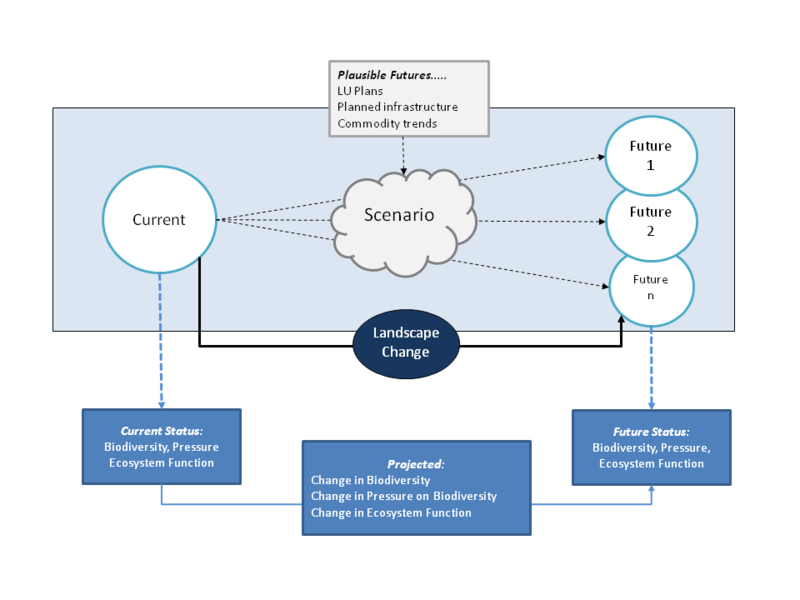 Scenarios can help to consider what future land-use may look like and the future contexts within which policy targeting land-use may have to operate. Quantifying and mapping the impacts of potential future land-use change on biodiversity and ecosystem services helps to visualise potential future pressures and spatial trade-offs. Understanding the drivers that underlie these impacts can inform action to address them. In combination, this suite of tools can help develop policies that are more robust and more likely to achieve their intended outcomes – even under unpredictable future conditions. 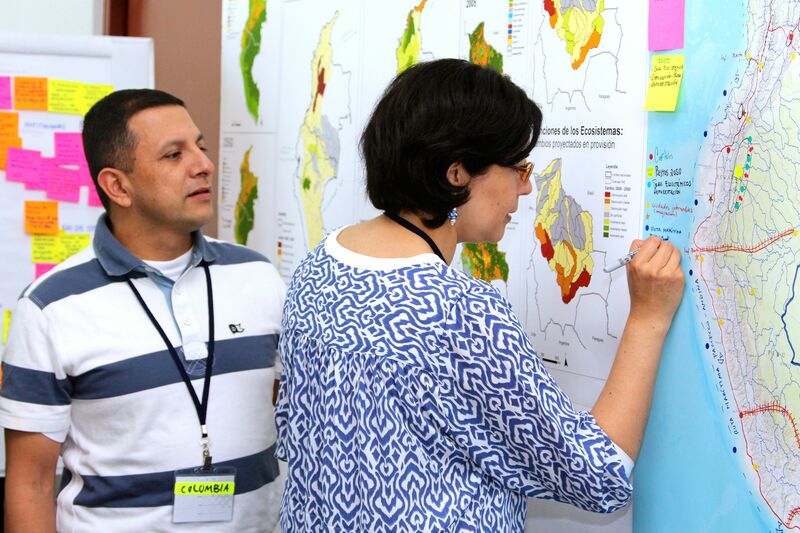 The first project “Commodities and Biodiversity” had a strong focus on methods review and development, modelling and mapping. Policy review based on the results took place at the regional scale in all three regions. The second project, focussed on the Lake Victoria Basin, built on these results by interpreting them at the sub-regional scale, further developing the analysis and assessing how this can support decision-making in relation to the current and likely future impacts of agricultural development on ecosystems, under a changing climate. The main outputs of this work are listed at the top of this page. Further information on the two projects as well as specific project outputs are detailed on their respective pages. At the UN Environment World Conservation Monitoring Centre we use our skills in assessing, modelling and mapping the status of biodiversity and ecosystem services and how this may change in the future, identifying current and future pressures and trade-offs with human development. We support national governments and regional bodies to apply these tools and knowledge to inform sustainable conservation and development policy. This work was funded by the John D. and Catherine T. MacArthur Foundation. UNEP-WCMC worked with the CGIAR Research Program on Climate Change, Agriculture and Food Security (CCAFS), Kassel University, the International Food Policy Research Institute (IFPRI), the Albertine Rift Conservation Society (ARCOS) and other partners, to develop and quantify socio-economic scenarios for each region, model scenario-driven land-use change and engage with national stakeholders and policy processes. Additional funding by UN Environment supported development of the e-Learning modules.